In Sudan, As Kalma Sheikhs Pardoned & Leave UN, Only Leak of Gambari's Plan Prevented Torture, US on Juba Beatdown? UNITED NATIONS, August 28 -- Eleven months after the UN came close to turning over to Sudanese authorities for punishment five sheikhs in the Kalma camp in Darfur, the five were finally pardoned and went home without being punished. Given that the punishment foreseeably would have included torture if not death, the aborted turnover is viewed as having saved them. 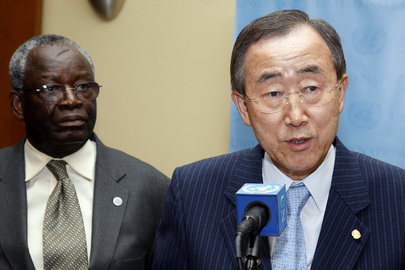 In late September 2010, Inner City Press was leaked a copy of the turn-over agreement that the UN and AU Joint Special Representative Ibrahim Gambari was negotiating with Sudan. The only safeguard that Gambari was seeking was a commitment to not execute the sheikhs. Inner City Press published the draft agreement. The next month while covering the UN Security Council's trip to Khartoum, Juba and Darfur, Ibrahim Gambari approached Inner City Press in the El Fasher camp of UNAMID and called the leaker -- and presumably the publication of the document -- "irresponsible" and having "put lives at risk." When the chairman of the UN Committee Against Torture Claudio Grossman came to the UN not long after, Inner City Press asked him about what Gambari had been doing, and he said no one in the UN system should turn anyone over to a government, like Sudan's, which tortures. Video here, from Minute 23:25. As it turns out, the leak and publication seemed to have saved the sheikhs. Gambari & Ban Ki-moon: they hate leaks but what saved sheikhs? At the same time as the sheikhs are being pardoned -- by the local wali, for Eid al Fitr -- Khartoum has sentenced to death a commander of the Darfur based Justice and Equality Movement, El-Tom Hamed Toto, for a joint attack with the SPLM-North in Southern Kordofan. Footnote: one wonders if the US will "welcome" the pardoning of the sheikhs. Recently the US State Department found time to welcome the dubious ceasefire announced by Omar al Bashir for Khartoum, while as yet seeming to say nothing about the UN's top human rights official in South Sudan Benedict Sannoh being beaten by ten South Sudan police while he lay in the fetal position. We'll see.